The Chappaquiddick incident was a single-vehicle car accident that occurred on Chappaquiddick Island, Massachusetts, on Friday, July 18, 1969. 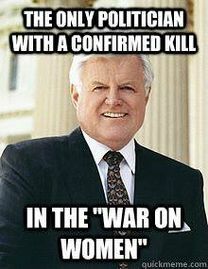 The late night accident was caused by Senator Ted Kennedy's negligence, and resulted in the death of his 28-year-old passenger, Mary Jo Kopechne, who was trapped inside the vehicle. According to his testimony, Kennedy accidentally drove his car off the one-lane bridge and into the tide-swept Poucha Pond. He swam free, left the scene, and did not report the accident to the police for ten hours; Kopechne died inside the fully submerged car. The next day, the car with Kopechne's body inside was recovered by a diver, minutes before Kennedy reported the accident to local authorities. Kennedy pleaded guilty to a charge of leaving the scene of a crash causing personal injury, and later received a two-month suspended jail sentence. On the evening of July 18, 1969, U.S. Senator from Massachusetts Ted Kennedy hosted a party at a rented cottage secluded on Chappaquiddick Island, which is accessible via ferry from the town of Edgartown on the nearby larger island, Martha's Vineyard.The gathering, at the cottage of Sidney Lawrence (41.3742°N 70.4707°W), was a reunion for a group of six single women all in their twenties that included Rosemary Keough, Esther Newberg, sisters Nance Lyons and Mary Ellen Lyons, Susan Tannenbaum, and Mary Jo Kopechne. The group (the only women invited to the party) were known as the Boiler Room Girls, and they had served on Robert F. Kennedy's 1968 presidential campaign. Present at the party were six older men which included co-hosts Kennedy and his cousin Joseph Gargan[Notes 1], and also Paul Markham, Charles Tretter, Raymond LaRosa, and Kennedy's 63-year-old chauffeur Joseph Crimmins. Paul F. Markham was a school friend of Gargan who had previously served as the U.S. Attorney for Massachusetts. Attorney Charles Tretter was a Kennedy advisor, Raymond La Rosa had known Kennedy for about 8 or 10 years and had diving experience, and John B. Crimmins (Kennedy's part-time driver) also attended the party. All but one of the men (Crimmins) were married, and all six women were single and 28 or younger. That weekend, Ted Kennedy was also competing in the Edgartown Yacht Club Regatta, a sailing competition that was taking place over several days. During the inquest into Kopechne's death, Kennedy testified that he left the party at "approximately 11:15 p.m." When he announced that he was about to leave, he claimed Mary Jo told him "that she was desirous of leaving, [and asked] if I would be kind enough to drop her back at her hotel." Kennedy then requested the keys to his car (which he did not usually drive) from his chauffeur, Crimmins. Asked why he did not have his chauffeur drive them both, Kennedy explained that Crimmins and some other guests "were concluding their meal, enjoying the fellowship and it didn't appear to be necessary to require him to bring me back to Edgartown. "Mary Jo told no one that she was leaving for the night with Kennedy, and in fact she left her purse and hotel key at the party.